When it comes to comfortable and affordable accommodations in Southern California, Best Western Plus Executive Inn is the smart choice. Our rooms and suites provide you with a welcoming home away from home in Rowland Heights with easy access to many area attractions including downtown Los Angeles and Disneyland. 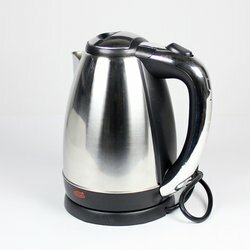 Stay connected to home or work with Free Wi-Fi in every room. Help yourself to coffee and tea to start your day. Store snacks or a doggy bag from one of the area’s excellent restaurants in your in-room refrigerator. When it’s time to turn in for the night, crisp white sheets and premium pillows invite you to a restful nights sleep. Our spacious rooms are perfect for families and groups with sofa beds for additional sleeping arrangements. 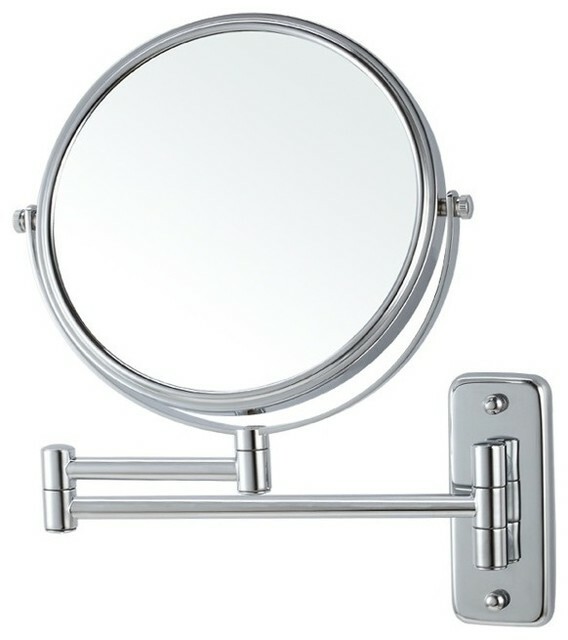 We are currently undergoing renovations at the Best Western Executive Inn to enhance each guests' experience with us. Guests will soon enjoy updated guest rooms, with remodelled bathrooms, new guest room furniture, a fresh coat of paint, and brand new lighting! The spacious king room is perfect for solo travelers or small groups and offers enough room for you to relax and unwind at the end of the day. Enjoy undisturbed free Wi-Fi, a microwave and refrigerator for quick snacks and easy food storage as well as full breakfast in the morning. This room also provides a cozy sofa bed for additional sleeping arrangements. 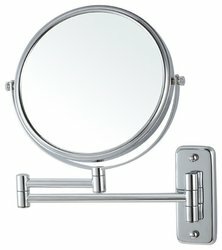 2-4 Guests MaxPeople / 288 Sq. 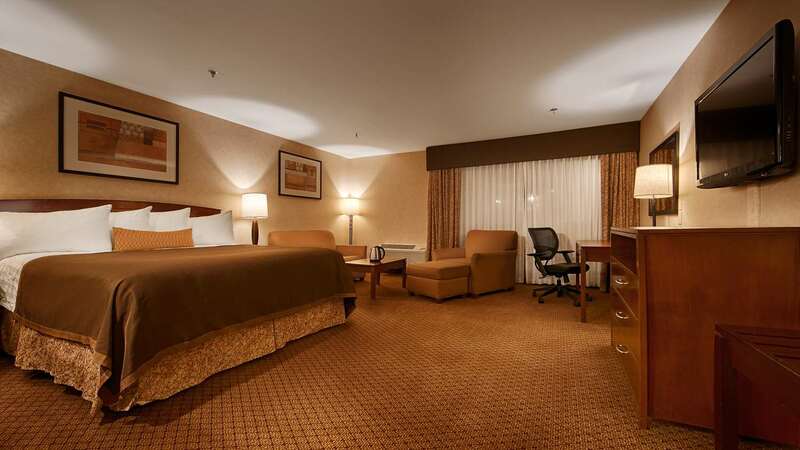 Ft.
Deluxe non-smoking exterior business room with 1 king or 2 queen beds. Furnished with sofa seating area, 42" flat panel television, refrigerator and microwave, coffee and tea service and oversize work desk. Room features triple sheeted beds with beautiful duvet coverlets and full private bathroom with vanity area. Additionally, complimentary WiFi, large in-room safe, bathrobes and slippers, 2 direct multi-line telephones, alarm clock radio, air conditionning, hairdryer, ron and ironing board. Exterior Access. 3 floors with elevator access. Parking lot /mountain view. 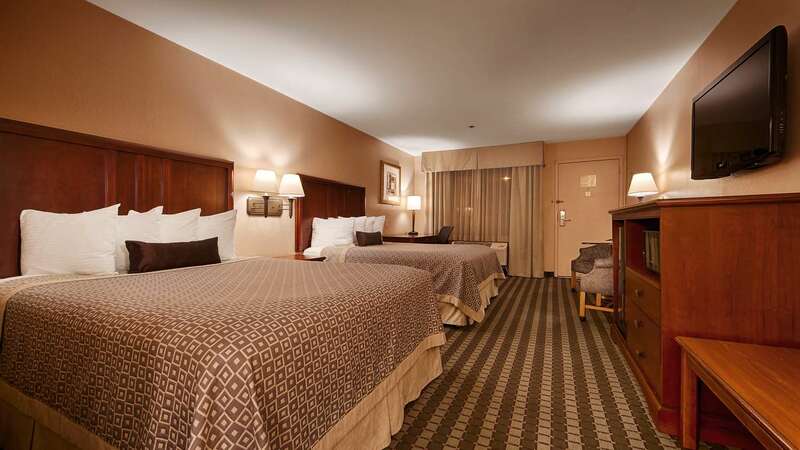 Families and groups traveling together will truly appreciate the comfort provided in this spacious room with 2 queen beds. Surf the net, connect with friends and share the best parts of your trip using our Free high-speed Wi-Fi. Wake up to a full breakfast to get your day started the right way. 4 Guests MaxPeople / 288 Sq. Ft.
Standard non-smoking room with 2 queen beds. Furnished with 42" flat panel television, refrigerator and microwave, coffee and tea service and work desk. Room features triple sheeted bed with beautiful duvet coverlet and full private bathroom with vanity area. 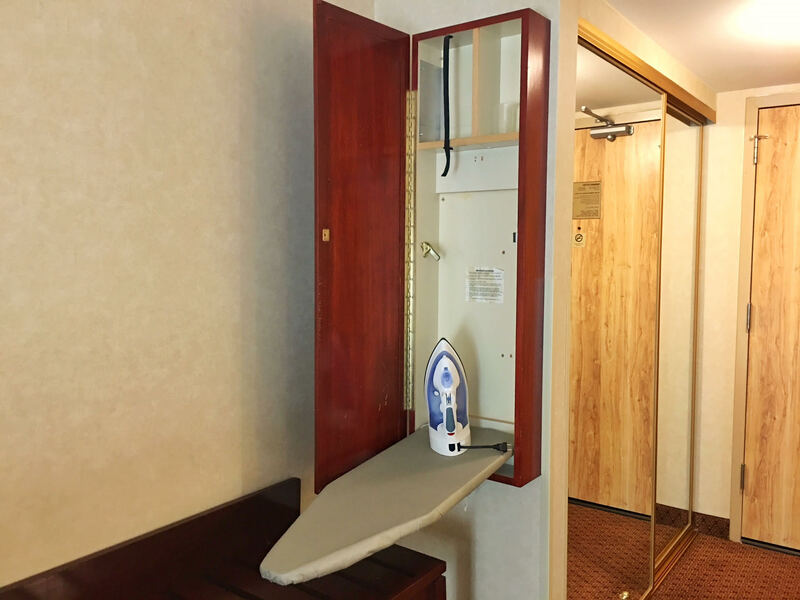 Additionally, complimentary WiFi, bathrobes and slippers, 2 direct multi-line telephones, alarm clock radio, air conditionning, hairdryer, ron and ironing board. Exterior Access. 3 floors with elevator. 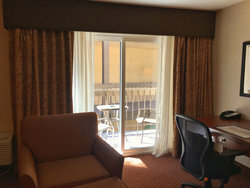 Some accessible and connecting rooms available. Freeway facing. Upgrade your stay to deluxe comfort. Enjoy undisturbed free Wi-Fi, a microwave and refrigerator for quick snacks and easy food storage as well as full breakfast in the morning. This room also provides a cozy sofa bed for additional sleeping arrangements. 2 Guests MaxPeople / 288 Sq. Ft.
Deluxe non-smoking interior room with 1 king bed. Furnished with loveseat , 42" flat panel television, wet bar with refrigerator and microwave, coffee and tea service and oversize work desk. Room features triple sheeted bed with beautiful duvet coverlet and full private bathroom with vanity area including upgraded bath products . Additionally, complimentary WiFi, large in-room safe, bathrobes and slippers, 2 direct multi-line telephones, alarm clock i-Pod dock radio, air conditionning, hairdryer, ron and ironing board. Interior Access from lobby. Parking lot view. This spacious suite offers additional comfort and extra room for you to stretch out and be yourself. Enjoy undisturbed free Wi-Fi, a microwave and refrigerator for quick snacks and easy food storage as well as full breakfast in the morning. 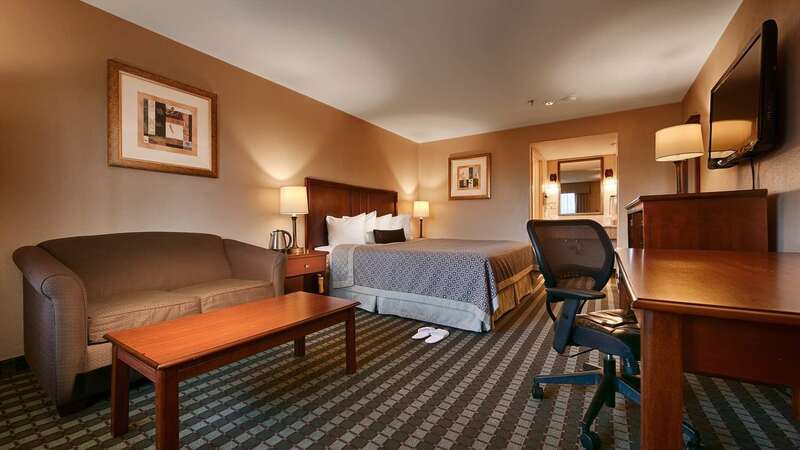 Our spacious guest rooms are the perfect accommodations for you and your guests. 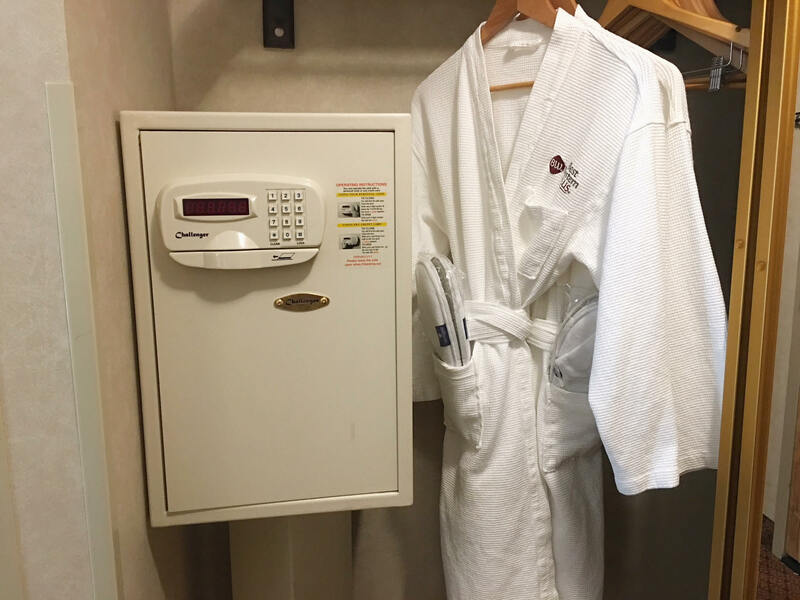 Guests planning a large-scale vent can enjoy special room bock rates when reserving accommodations for attendees, providing them with access to all the hotel’s amenities as well as an ideal location close to some of the area’s top attractions. 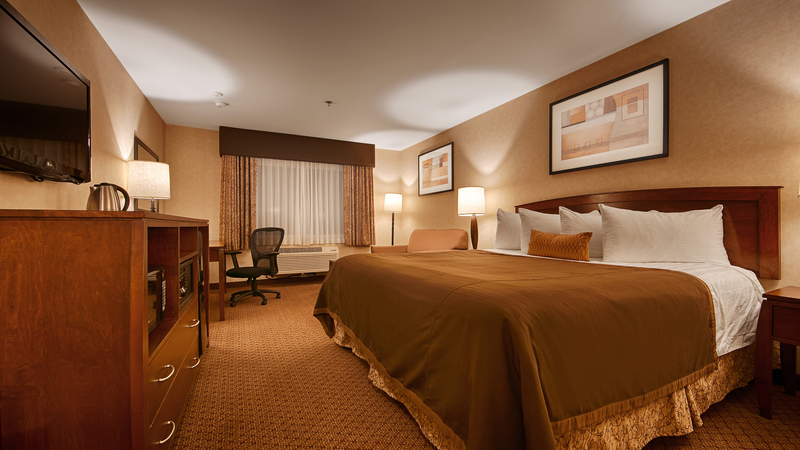 Enjoy the relaxing environment of this spacious junior suite with two king beds. 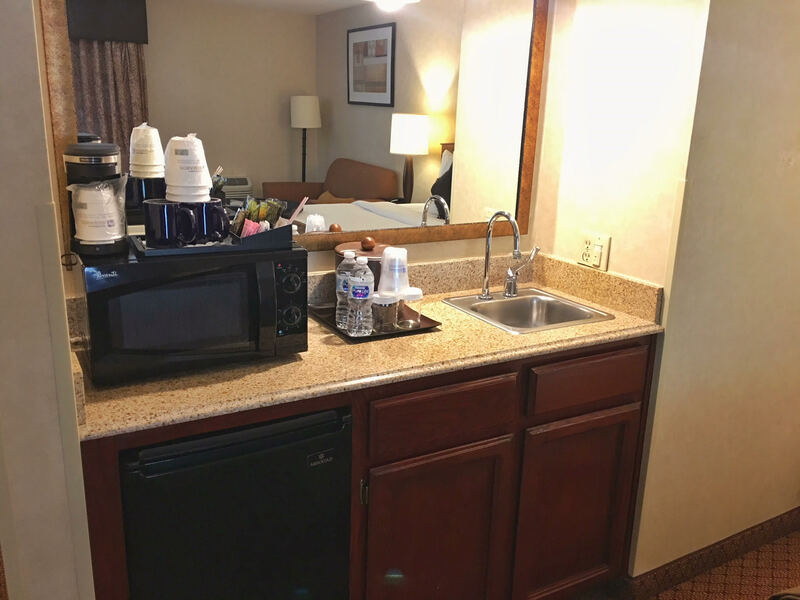 This suite includes everything you need to enjoy your stay with us including free high-speed Wi-Fi, free local calls, in-room TV entertainment and more. Join us for complimentary breakfast each and every morning of your stay. 4 Guests Max People / 400 Sq. Ft.
Deluxe non-smoking junior suite with 2 king beds. Furnished with 42" flat panel television, wet bar with refrigerator and microwave, coffee and tea service and balcony to courtyard. Room features triple sheeted beds with beautiful duvet coverlets and full private bathroom with large vanity area including upgraded bath products . 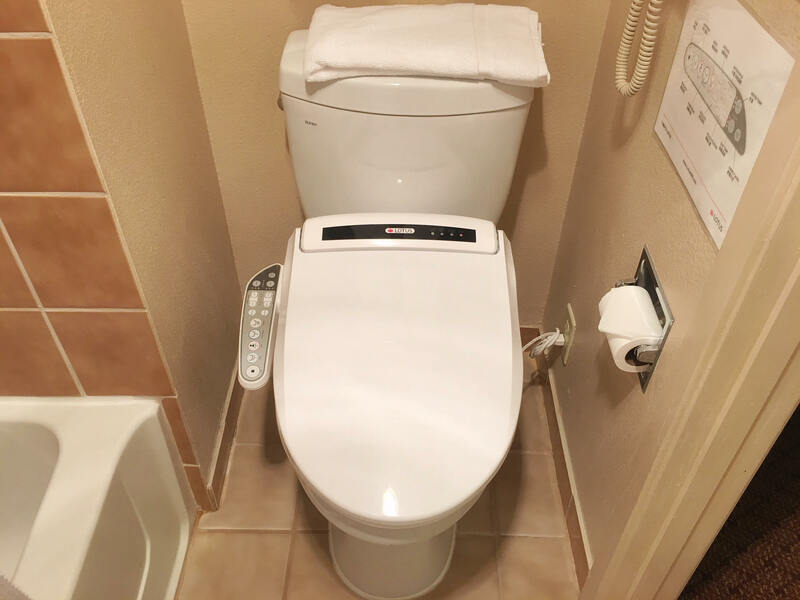 Additionally, complimentary WiFi, large in-room safe, bathrobes and slippers, large work desk with ergonomic chair, 2 direct multi-line telephones, alarm clock i-Pod dock radio, air conditionning, hairdryer, iron and ironing board. Interior Access from lobby. All interior corridor rooms are equipped with bidet toilet seats. An extra added amenity for the guest to enjoy their experience with us! 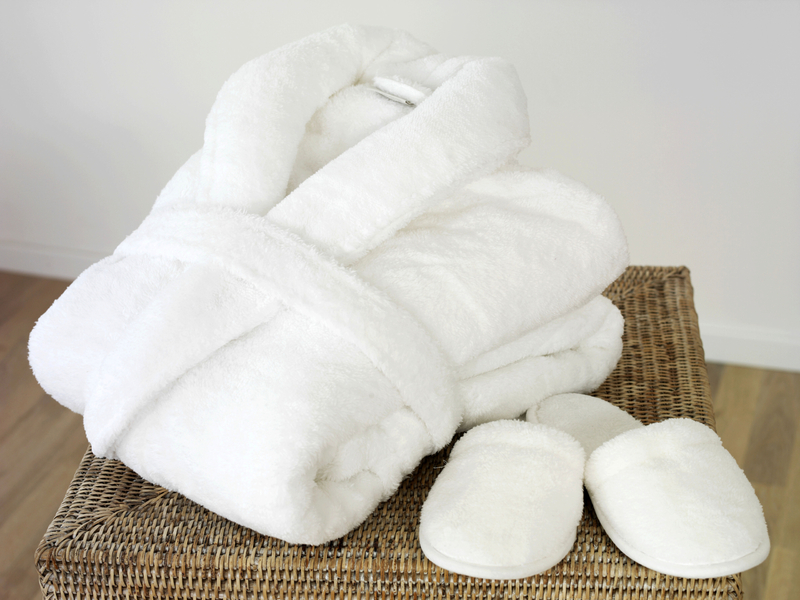 Our Award Winning Jr. Suite is also added with upgraded in room Bathrobes and slipper for the guest to enjoy. The extra large in-room safe is also complimentary for the guest to use. 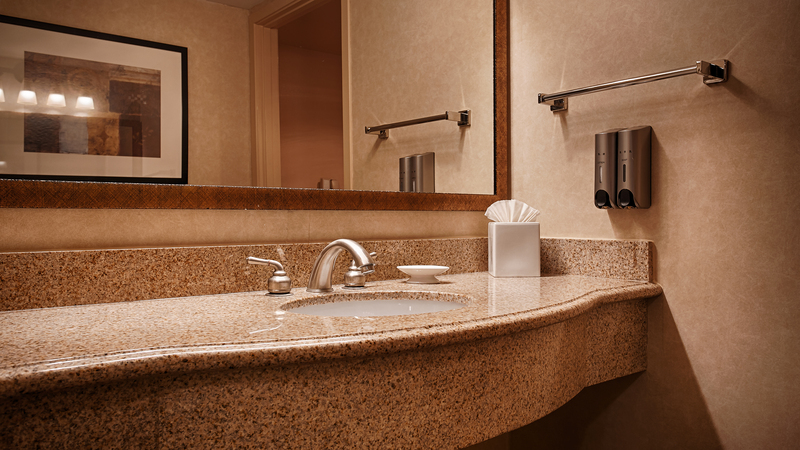 Our Award Winning Jr. Suite includes in room wet bar. The additional spacious counter-top space and additional sink area for the whole family to enjoy!